There is an energetic pull to the East End rooted in the natural environment. The Atlantic Ocean, and surrounding bays and harbors have long been the backdrop to the idyllic Hamptons home. Farms and preserved open space are a reminder of Long Island’s humble beginnings, and something that both year-round residents and second homeowners yearn to protect. The environment also inspires design with designers translating its colorful palates and ethereal beauty into various living spaces. With a mission of bringing the outside in, and limiting her impact on the environment itself, Shannon Willey, designer and owner of Sea Green Designs, creates modern spaces that honor the natural aesthetic of the Hamptons. Examples of Willey’s work show an all-encompassing coastal design that is both aesthetically pleasing and functional. Using a neutral backdrop in shades of soft white and creams creates an open, airy feel while also serving as the ideal canvas for furnishings and accessories that will display the homeowner’s sense of style. 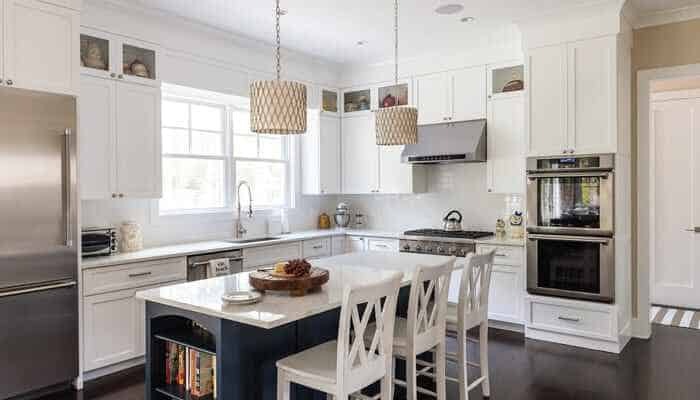 Different design pieces on the blue spectrum, such as light, cooler tones in textured seating or bold navy in the heart of the kitchen at the center island show a range of how this signature coastal color can be used. Natural sea-inspired accents like wall hangings, driftwood style accent pieces like side tables, nightstands, and stools, and layers on beds and seating make the beach-style home warm and inviting. Willey has a degree in environmental studies, which has been a major influencer in her business. Sourced products are eco-friendly, meeting criteria such as being made with renewable, recycled, or repurposed materials, support social equality or fair-trade, made locally or hand-crafted, are long lasting and of high quality, use organic materials, soy-based foams, low VOC finishes, and more. It is through these standards that the only footprint Sea Green Designs leaves is in the sand. Solid wood furnishings from Gat Creek are handmade in the US for living, dining, office, and bedroom spaces, and lend themselves well to coastal design. Collections from Neem Living are also a perfect brand for this style as it marries American design with thoughtfully created fabrics from India in varying tones inspired by nature. For repurposed products that mix in well with Willey’s design aesthetic, Europe2You not only creates beautiful accent pieces, they also have a strong commitment to sustainability. 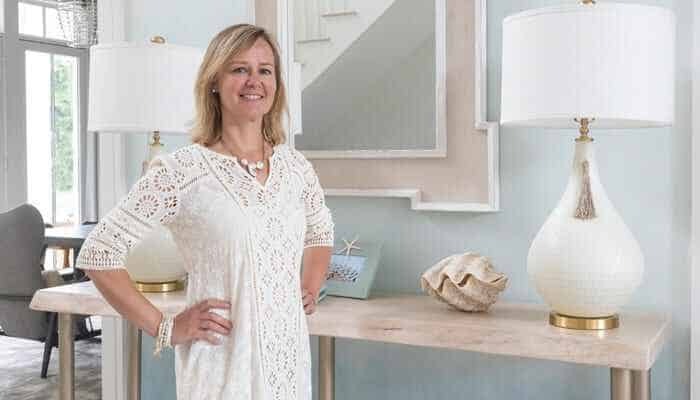 In addition to interior design services, Sea Green Designs also has a retail boutique in Southampton offering coastal inspired furnishings, accessories, and garden furniture. Along with Willey’s aforementioned beloved brands, environmentally-conscious furnishings from Vanguard and nature-inspired outdoor furnishings from Fermob are some other companies customers can expect to find. The process of working with Willey as an interior designer is very involved, and rightfully so. She asks a lot of questions during a two-hour consultation in an effort to understand what is most important to the client and how they see themselves using the various spaces within the home. The aesthetic a client is looking to achieve is clarified, as well as planning for space, color schemes, and architectural elements. There is an option for custom designs and pieces as Willey sources from many different companies, creating a truly unique space reflective of the homeowner. With this information Willey then develops a design concept that is reviewed and tweaked as needed. It is a truly collaborative effort with an end result that often exceeds expectations. There is a misconception that coastal equals summer, which is not necessarily true in the Hamptons. The season extends itself a bit further each year, and many second homeowners are using their homes more often, especially during the holidays. With the deep chill of winter to come, there are several simple ways to take your existing coastal-inspired spaces and add a cozy feeling while keeping in with the overall aesthetic. Throws in wintery, coastal colors like cream, silver, and shades of blue add a warm touch. Decorative pillows of recycled materials depicting sea creatures and holiday sayings are a complementary accent, as well as traditional décor like wreaths but made of seashells and other natural materials. A boutique home furnishings store and interior design business, Sea Green Designs has a strong understanding of its craft, but also its impact on nature. Offerings in the store and materials used in interior design projects are inspired by the coast and handpicked for their elements of sustainability. Through her work Willey raises an awareness of the importance of honoring and protecting the natural world, and brings it to life in living spaces. The end result is a gorgeous design you can feel really, really good about.